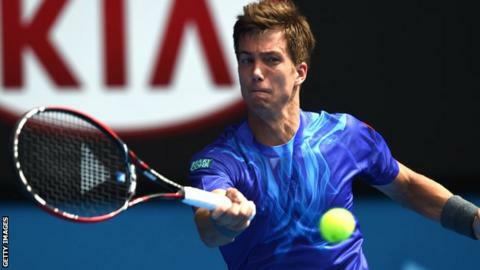 New British number two Aljaz Bedene has been knocked out of the Casablanca Open in the quarter-final by Jiri Vesely. The Slovenia-born 25-year-old was beaten 6-1 6-4 by third seed Vesely, from the Czech Republic. Bedene was playing in his first tournament since being granted a UK passport in March. The world number 99 is planning to appeal against a new rule which prevents players from ever representing more than one country in Davis Cup.